Lorna Hallahan has been a social worker for over 35 years, including as an academic at Flinders University since 2006. Prior to coming to Flinders, Lorna practiced in a range of settings, including disability advocacy and the management of a loss and grief service. She is currently Head, Social Work at Flinders University and President, Australian Council of Heads of Schools of Social Work. 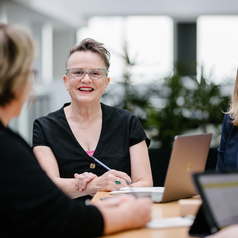 Lorna is Co-Director of the Flinders Social Work Research Innovation Living Space, pursuing research aimed at developing social work knowledge and the workforce through collaborative projects focussed on complexity, intersectionallity, inter-sectoral and inter-professional practice. Lorna has been a significant and long term contributor to the development and analysis of disability policy. In 2015, Lorna was appointed the Independent Reviewer of the SA Adoptions Act (1988) and she is a member the SA Premier's Women's Council. Lorna speaks and writes regularly on issues related ethical issues for workers in complex human services.